Today you have the opportunity to win three of these patterns - actually three of you do! Sara is giving away 3 patterns to 3 winners! - To win all you need to do is leave a comment, maybe you could let us know what type of bags you like to sew or which patterns you would love to win. - My followers get a second entry, just leave another comment letting me know how you follow. For the love of all that is my sanity will you please check if you are a no-reply blogger (if you don't get emails from bloggers then you probably are!!) and if in doubt LEAVE YOUR EMAIL IN THE COMMENT otherwise you will not win. I will chose the winners using random.org on Tuesday 23rd April. Good luck! The petrillo and aeroplane bags are my favorite this is super exciting. I love to make any bags, the bigger the better.......she does have some awesome patterns! i am a follower by google blogger! I would pick: Aeroplane bag, Paparazzi Bag and Dot Dot Dash bag - although it was very hard choosing due to the fact they are all lovely. I haven't yet tried to make a bag - but maybe this is what I need to get me started! I love the look of the Petrillo bag! I would love to win the Aeroplane bag, the Velocity Girl and Locked and Loaded (or maybe Dot Dot Dash?) patterns! I love the Velocity Girl and Locked and Loaded patterns. Thanks for the chance to win! I've never made a bag before (working on my first now!) but I love that aero plane and sunrise clutch design!! I would love to win the paparazzi bag and the aeroplane bag. I follow with my blogger dashboard. I have signed up for bloglovin too, but I don't really follow the emails. I love the dot,dot dash bag! I'm soon to embark on an Amy butler messenger bag - and bought her weekender pattern today for a hundred years time when I feel confident enough to tackle it ;o) But I'm really a bag novice! I would love to win The Soda Pop bag, Dot Dot Dash Bag, and Locked and Loaded Bag!! Oh my, how generous. I would love to make the aeroplane bag. Nice! Making bags is something on my "to-do" list. It seems I never quite have a enough of them and can always use a new one. I'll be checking these patterns out for sure. I love making large totes and small bags. I always enjoy a bag with some sort of dividers so there are places for everything. What a lovely giveaway! I love making messenger bags and small bags that can go across the body. Thanks for the chance to win! They are all beautiful and I love the cute names! Dot dot dash looks fun. Thanks for a great giveaway! I love the locked and loaded bag. It would be my first ever bag if I made it. Thanks for the chance! I've had my eye on her aeroplane bag for a little while now. I'm not great at bag making, I think because I dont' have access to the same interfacings that are specifically called for a lot of the time, so I use something else and sometimes it works and sometimes I'm sorely disappointed. I follow you by bloglovin'. Wow - what a great giveaway! I love the aeroplane bag, the clutch, and I really love the Petrillo bag. Thanks for the chance to win! Oh yes, almost forgot, I'm a follower as well. I'd love to win a bag pattern! Who am I kidding; I'd love them ALL!!! Ooh, I have been dying for the Aeroplane bag! I like the Petrillo, Aeroplane and Velocity patterns. Thanks for the chance to win! Having seen several Aeroplane bags on blogland I really NEED to make one.....if i dont win I'll be buying the pattern as I've just bought the fabric today !!! I follow you lovely Lucy. I still have my eye on the Aeroplane bag pattern...it is SO cute! I just love bags, especially large ones lie the aeroplane bag. I LOVE bags! My favorites are messenger bags and tote bags with pockets. Thanks for the chance to win the gorgeous patterns! I would sew an Aeroplane bag! I´m a follower of your blog, Lucy! love these bags, I have the camera bag, but haven't made it yet! I really love the aeroplane bag. I love the little Aeroplane bag. How cute is that? I haven't really ventured into bag making though it's on my list of things to do ... That Aeroplane Bag has caught my eye, you'd feel like a jetsetter with one of those. I like to make bags like totes and smaller bags for my grand daughter. Thanks for the chance to win. I love making shoulder bags, with interesting fabric. I like the look of that Aeroplane bag! And I love to travel, so I might have to try that one out! I really enjoy making my own bags, and Sara's patterns are amazing. Really like the Aeroplane bag! Thanks for the giveaway. I follow you on Bloglovin'. Thanks for the chance to win! I have made a few bags but would like to tackle a one which would be big enough to take away on a few days holiday. I love bag patterns. I make lots of bags but give most of them away. I love all bag patterns for the most part with two requirements; longer, adjustable shoulder straps, and a larger bag with pockets inside.oops, guess that was three and I just thought of one more and that's an outside pocket on the side/end of the bag with a flap closure with velcro for my cell phone so it's easily accessible. I do love many of Sara's bag and yes, even those which don't fit my list of things I want in a bag. 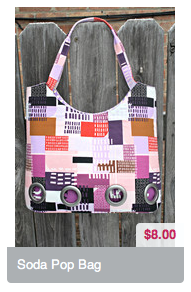 I can think of many of my family and friends that would love a bag made from her patterns because they are super cute. I'll make it easy even though I know it's linked to my profile 'cause I'd hate to see you go crazy. ;) vburr at charter dot net. I am already a follower via email notification as well as GFC. I've made clutches before but nothing as pretty as these bags! I love that Locked and Loaded bag! Thanks for the giveaway. They're all nice bags it will be hard to choose if I win. I have been making quite a few Messenger bags of late! I like making different bags- Totes were great at Christmas, but I have made evening bags and handbags too. I really love Sara's patterns & I'd love to make the Petrillo bag. Thanks for the great giveaway. I follow your blog, via email subscription & Bloglovin, thanks. I'm planning an aeroplane bag already (in funky Alexander Henry tattoo girls!) so to win one of them would be amazing! But velocity girl is the business, too. And dot dot dash and locked and loaded!! I've only made totes and a clutch, but really want to have a go at that aeroplane bag! I'm yet to attempt a "real" bag like these! I'd love to try the Petrillo and the Aeroplane bags! I like the Locked and Loaded Bag, the Velocity Girl Bag and the Dot Dot Dash Bag best. I follow you via Blogspot, and I've tried Bloglovin', too. I like Blogspot better, though, so I'll use it as long as it's there. I want the aeroplane bag - just saw it finished on don't call me Betsy and it looks great! And I follow of course! the aeroplane is my fave. i've been seeing some lovely versions out there! 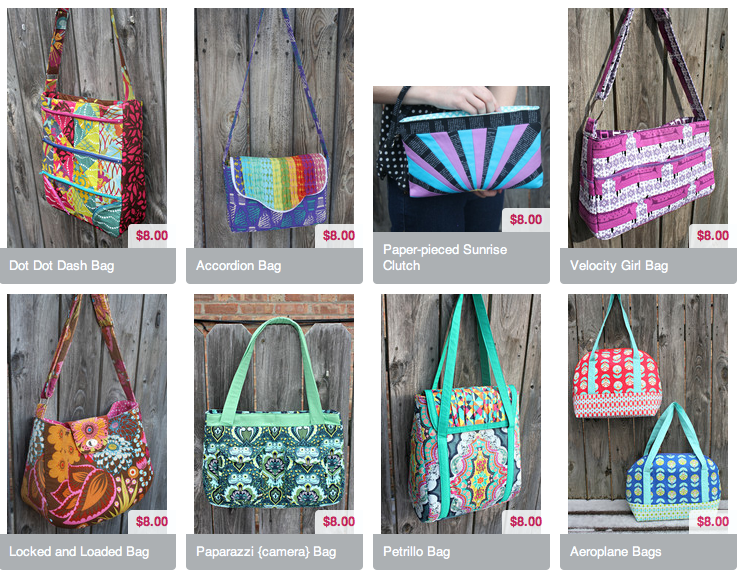 I just love the Accordian Bag, the Soda Pop bag, and the Velocity Girl Bag. Thanks for the opportunity to win 3 of her patterns. I have been seeing the Aeroplane bag popping up around and I would love to give it a try. Dot Dot Dash, Aeroplane and Paparazzi are top of my list. Thanks for the giveaway Lucy and Sara! I like a shoulder bag! With lots of room! But love the aeroplane bag and soda pop looks fun too! I follow you Lucy - like a little sheep! I am a follower by email ! I like ALL of them, but the Aeroplane bag really caught my eye ! What a wonderful assortment of bags! My favorite is the accordian bag! I love all bags. Seriously. But I love the Aeroplane bag, and I'd really love to see the inside of that thread bag you made! I like the locked and loaded bag but I like all bags! Now can I sew it is the question but If I win I bet I will sew 3 for me! I follow you because Your sweet, funny, bold, talented and your son wears tablecloths! Locked and loaded .... And the aero plane bag would be my first picks! As for a third, boy, I'm not sure... They're all so great! I still haven't braved a bag yet! Everyone seems to enjoy making bags - I fancy trying the Aeroplane bag. I've never yet made a bag, but my first will be the aeroplane bag. All her patterns look really great. I haven't made a lot of bags, but when I do, I like to add lots of pockets. I above get to make a "real" bag. I made a monster satchel years ago (fake fur, googley eyes) but since then, nada. I did make some zip pouches which I liked but I'd like to make more to perfect them. I'd love to give these patterns a go. I follow through GFC. I love all bags but I'd like to attempt the aeroplane bag. I love the aeroplane bag! Looks like the perfect bag for summer! I'd like to try the aeroplane bag I think. I follow you in Bloglovin too. Thanks for the give-away with a chance to win a pattern! It has been fun following the blog! Oh my goodness fab giveaway!! I love making totes - big bags to hold all my schtuff when I go out and about!!! I really like the Soda Pop Bag, although all of them are lovely. I love the Aeroplane bag and the accordion bag. They are ALL adorable!! This is something I need to learn to do - MAKE BAGS! Thanks for the chance at the giveaway!! Your thread bag is wonderful. I love the look of the clutch. A bag with multiple pockets would be handy. I'd love to make some bags! Thanks for the chance to win.